The ACL model provides a great blueprint for leadership and the management of any team, group or organization. Leadership is an ancient ability about deciding direction, from an Anglo-Saxon word meaning the road or path ahead; knowing the next step and then taking others with you to it. Managing is a later concept, from Latin ‘manus’, meaning hand, and more associated with handling a system or machine of some kind. The original concept of managing began in the 19th century when engineers and accountants started to become entrepreneurs. There are valuable elements of management not necessarily found in leadership, eg administration and managing resources. Leadership on the other hand contains elements not necessarily found in management, eg, inspiring others through the leader’s own enthusiasm and commitment. The Action Centred Leadership model therefore does not stand alone, it must be part of an integrated approach to managing and leading, and also which should include a strong emphasis on applying these principles through training. 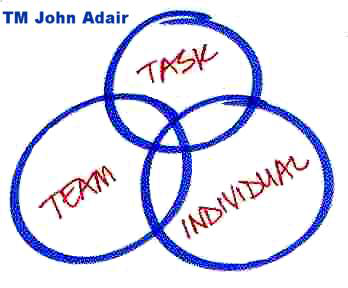 Adair also promotes a ’50:50 rule’ which he applies to various situations involving two possible influencers, eg the view that 50% of motivation lies with the individual and 50% comes from external factors, among them leadership from another. This contradicts most of the motivation gurus who assert that most motivation is from within the individual. He also suggests that 50% of team building success comes from the team and 50% from the leader.